MERGING FASHION AND ILLUSTRATION, MY BRAND AIMS TO TELL A NARRATIVE THROUGH SURFACE PATTERN ELEMENTS USING PRIMARY RESEARCH PROJECTS CONNECTING WITH AN AUDIENCE AND MUSES. THESE MUSES CREATE CHARACTERS WHICH INFORM EACH LOOK OF THE COLLECTION TELLING A NARRATIVE THAT CAN BE INTERPRETED AND TOLD IN MULTIPLE DIFFERENT WAYS DEPENDENT ON THE INTERPRETER. CREATING NARRATIVE WITHIN FASHION AIMS TO SUCCESSFULLY TELL A STORY, CONNECTING WITH AN AUDIENCE AND CREATING PERSONAL RELATIONSHIPS BETWEEN THE DESIGNER AND CONSUMER, BY CREATING ICONIC CHARACTERS ALLOWS THEM TO BECOME PART OF THE COMMUNITY AND STORY. 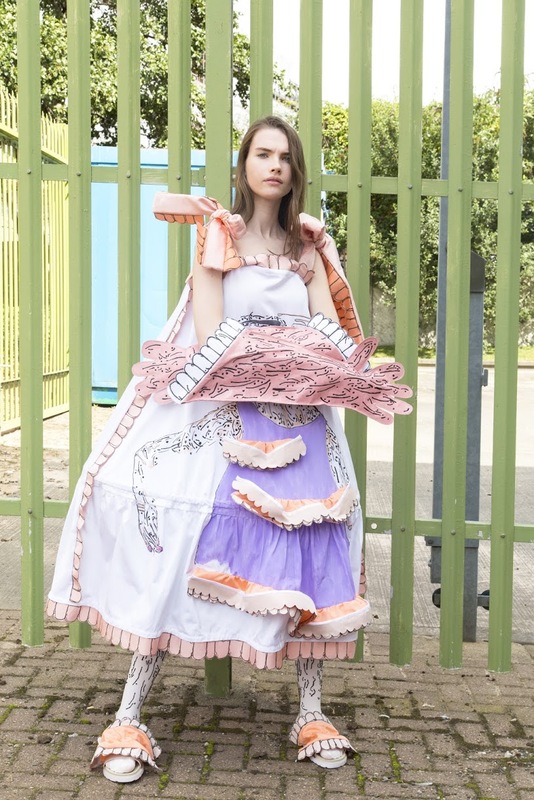 USING NARRATIVES FROM THE WORLD AROUND ADDRESSES ISSUES AND VALUES ALLOWING THE WEARER TO EXPRESS ISSUES THEY CONNECT TO THROUGH CLOTHING. HAND RENDERED ILLUSTRATIVE TECHNIQUES CAN BE SEEN THROUGH LARGE SCALE ILLUSTRATIONS, PRINTS AND MOTIFS. INFORMING THE CHARACTERS THROUGH DESIGN BRINGS THE ILLUSTRATIONS INTO A 3D FORM; RESPONDING TO EMERGING FASHION TRENDS BY COMMUNICATING A NARRATIVE IN ONE’S OWN SCALE.